It's another typical story concerning the trials and tribulations of a man and his monkey. 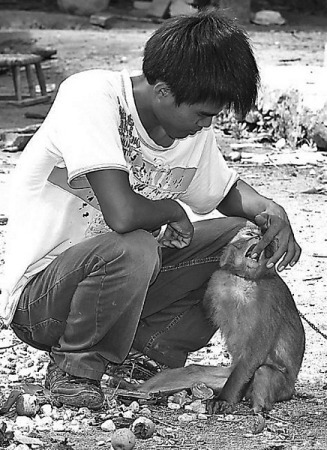 It goes like this: Man saves monkey's life. Monkey earnestly attempts to repay man. Monkey slaughters 80 chickens. Man severely beats monkey. Man evicts monkey. Monkey repents. Man forgives monkey. Monkey turns out to be a protected species. Authorities order its release into the wild. Monkey refuses to go. Monkey and man continue their rocky relationship. Yunnan Province's Spring City Evening News reports the unnamed monkey was rescued by Mr. Li Chun last May when Li found it badly injured in a forest in the southwest of the province. According to Li, to save the monkey's life he had to amputate an arm and a leg. He then guided the monkey through a lengthy rehabilitation period. Once recovered, the monkey was eager to show his gratitude to Li. Li says the monkey wipes away his tears when he cries, but he didn't divulge the reasons for his tears or how often he cries. The monkey displays affection for the family's dogs -- as if they were the monkey's own children. However, the heart-warming story took an abrupt turn when the monkey began to imitate its master. "After seeing me crack eggs, the monkey decided to search for eggs in the henhouse and crack them all," Li said. He assumed the monkey's heart was in the right place, but now all Li's hens do their laying at his neighbor's. But then it went beyond the misdemeanor of cracking eggs. After observing Li slaughter a chicken, the one-armed monkey slaughtered another 80 while meticulously plucking off their feathers. Li responded by severely beating his monkey. The corporal punishment seemed to work, but when Li was away the monkey continued to harass the chickens. Several times, Li kicked the monkey out, but each time, the monkey put on a sad, sulky face, and Li couldn't resist taking him back. This May, local forest police learned the monkey is a rare species under state protection, so authorities asked Li to release the monkey into the wild. But the monkey refused to go. Authorities decided to grant Li custody after considering their significant relationship, and recognizing the difficulties the disabled monkey may encounter in the forest. Police have stipulated that Li must regularly file reports on the monkey's health.